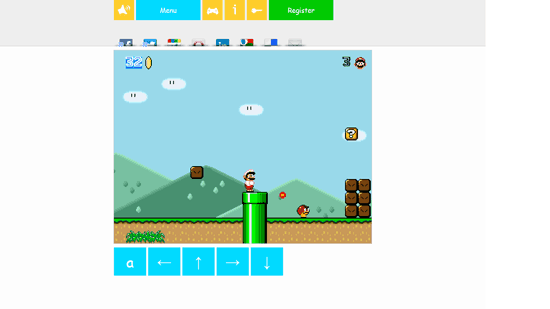 Super Mario Touch is an adventure game based on the popular classic game of Super Mario Bros. Super Mario Touch is free for Windows 8 and 8.1. The original game of Super Mario Bros gained massive popularity and is still very famous. It was initially released in the year 1983, since then the game has been the best Nintendo game for everyone. Super Mario Touch will make you bring back the old memories you had with Super Mario. The game of Super Mario Touch works the same way as of the original game. The environment of this adventure game is similar to the original game too. There are small tortoise walking on the ground, if you mistakenly hit them Mario will die and will lose a life. As the game keeps going, you will face different animals, elements and objects that will become a hurdle for you in the game. Mario has three lives in the game that help him play the stage even after he died. You have to collect the coins that are hanging in the air, they will help you gain extra life when you collect 100 coins. 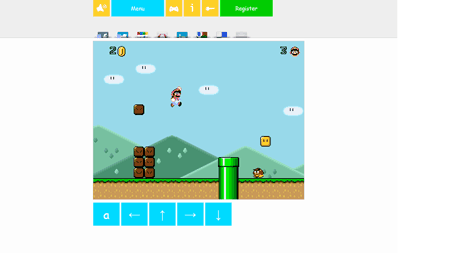 You can also hit the golden blocks or bricks by helping Mario jump. These golden bricks or blocks also have coins in them and some of these bricks have food in them. The food for Mario are mushrooms, after eating them he gets energy and becomes bigger. After eating the first mushroom, you will gain access to the flower which can be eaten by Mario to get power. Mario’s clothes change after he eats the flower. With the help of the power, Mario can shoot and kill the animals and other elements that come in his way and are hurdle to him. The game can be controlled with the arrow keys and A key. Left arrow key will help move Mario towards left and the Right arrow key will help moving him to right. The Up arrow key will make him jump and the Down arrow will make him sit or hide down. The A key will help Mario throw or shoot bullets when he gets the access to them. Other Super Mario style games which you can try out bouncy monster and candy man. 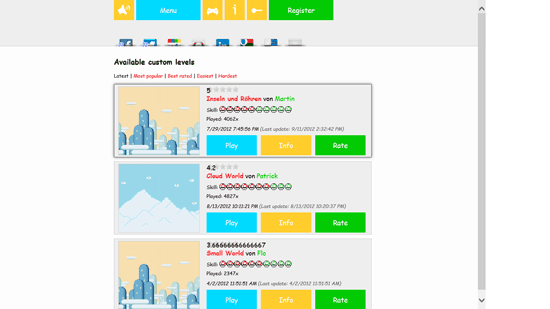 In the game, you can make new levels by clicking on create level. You can also play other levels by clicking on choose level. While playing the game if you don’t want to use the arrow keys then you can use the arrow buttons displayed on the bottom of the environment.